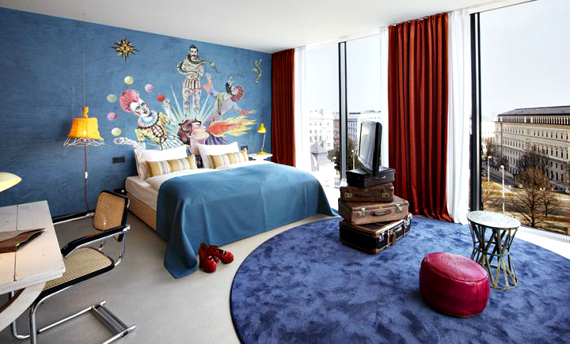 Smack dab in the center of the 7th District; Vienna’s young, liberal, creative scene is a new eclectic boutique hotel. The 25Hours Hotel Wein is a fantastical world of extravagance, with just a touch of madness—mirroring the city itself. The neighborhood, a carefully blended mix of baroque and modern architecture, is the perfect setting for a design hotel like this. 25Hours is housed inside a rectangular modern building with a massive glass “green house” on the roof, providing hotel patrons with a grand rooftop bar. Inspired by the Circus at the beginning of the 20th century, 25 Hours’ design combines antiques cleverly with Memorabilia from the circus ring.